Pool, Annelies. "Fort Smith". The Canadian Encyclopedia, 12 July 2016, Historica Canada. https://www.thecanadianencyclopedia.ca/en/article/fort-smith. Accessed 20 April 2019. Fort Smith, NWT, incorporated as a town in 1966, population 2093 (2011c), 2364 (2006c). The Town of Fort Smith is located on the southwest bank of the SLAVE RIVER near the Alberta-NWT border, 724 air km north of Edmonton. Fort Smith, NWT, incorporated as a town in 1966, population 2093 (2011c), 2364 (2006c). The Town of Fort Smith is located on the southwest bank of the SLAVE RIVER near the Alberta-NWT border, 724 air km north of Edmonton. 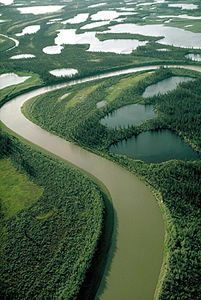 Situated on the river that was an important link between the Prairies and the MACKENZIE RIVER valley, the site was a PORTAGE route around 3 sets of rapids. The HUDSON'S BAY CO established a trading post here in 1874. 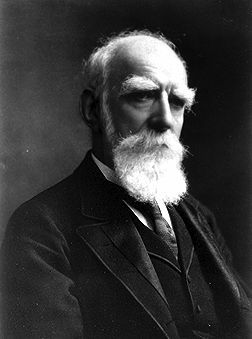 The post was named in honour of Donald SMITH, later Lord Strathcona, an HBC governor and member of the first NWT Council. Smith was an enthusiastic supporter of the Canadian Pacific Railway, and his financial backing was essential to its progress (courtesy Library and Archives Canada/C-3841). The settlement was affected by the Yellowknife GOLD RUSHES when prospectors rushed through the area. Fort Smith was the first administrative centre in the NWT and served as government headquarters until the territorial capital was established in Yellowknife in 1967. Today the town is a centre for education and government administration and includes an active business centre.